Home » Website Building » SEO » How to Submit Sitemap to Google? In order to submit your Sitemap you need to have a Google Webmaster Tools account, added and verified your site successfully. Upload the Sitemap in your site’s root directory. Check your Sitemap URL in the browser address bar to ensure it can be accessed. Remember to check your verified site, preferred domain setting and Sitemap are for the same domain. For example, if you set your preferred domain as www then remember to submit your Sitemap also as “http://www.yoursitename.com/sitemap.xml”. How to Submit a Sitemap? Login to your Webmaster Tools account and select the site. Go to “Sitemaps” section under “Crawl” tab. Click on the “Add/Test Sitemap” button to first test your Sitemap and confirm Googlebot can access it successfully. Once the test is successful then add your Sitemap following the same process. After your Sitemap is submitted it will be in Pending status till the time Google process it and Google normally process the Sitemaps every day. After processing of your Sitemap, you can see all other details like date of processing, issues in your Sitemap and type of Sitemap submitted will get updated. Check number of Submitted URLs versus number of Indexed URLs by Google. This information is displayed as a count as well as in a graphical format. Click on the “/sitemap.xml” link to see your Sitemap in a browser window. Warnings and Error count in processing your Sitemap is showing under “Issues”. 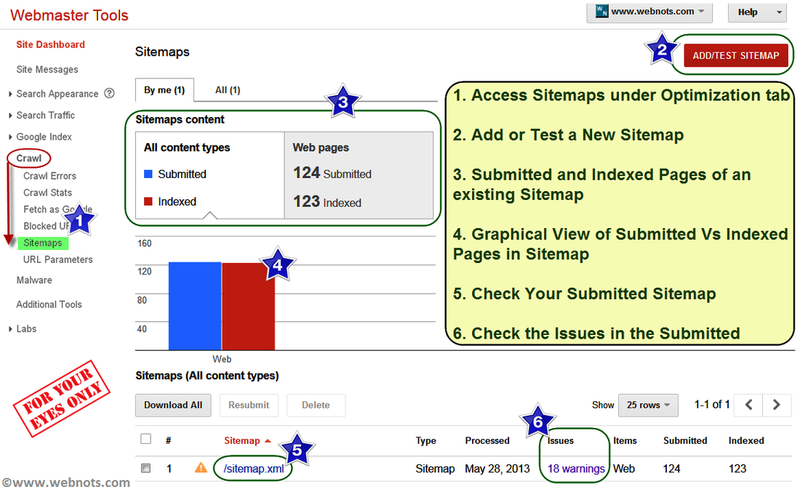 Clicking on the number of warnings or errors will show you the detailed issues in your Sitemap. For example if an URL in your Sitemap if blocked by Robots.txt then Googlebot can’t crawl that URL. This will be shown here as a warning. After correcting the warnings and errors, you can resubmit the same Sitemap for processing. You also have an option to delete the existing Sitemap and submit a new one. You can see your Sitemap details in the “Dashboard” section of your Webmaster Tools account which will show you the submitted Vs indexed URLs in your Sitemap.